If you’re a little bird-crazy like us, keeping feeders filled is a priority that takes time – in fact it’s a daily chore lately due to some bully birds hanging around the yard. Only filling feeders about one quarter of capacity, because no matter what’s offered… it’s gone in a few hours! And we’re not even talking squirrels here… grackles, starlings and doves are the culprits. Isn’t it time for them to move on yet? Because squirrels are enough menace in their own right, every single bird feeder has a baffle on it, even bluebird houses have baffles to protect nests from curious paws. But outwitting the critters really isn’t as difficult as some may think. Squirrel Proof Bird Feeders with cages like this are very effective against both squirrels and larger, less desirable birds. Some of the caged feeders are let’s say, kind of cheesy, but this large capacity model is super quality and made in the USA. With a big three gallon capacity, and built in seed tray to catch waste, this super squirrel-resistant feeder even has an innovative design that makes it simple to fill and clean. The PVC feeder tube will never yellow like some of the acrylic tubes, and stainless steel feeder ports retain their shiny new look. 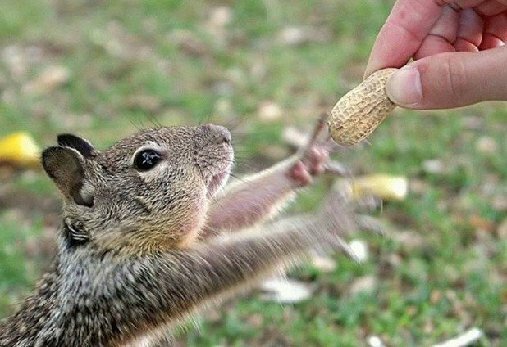 Don’t get us wrong… we feed the squirrels too, but somehow that’s never enough either. May be time to look into one of these for our own yard? And although a bit overboard with our wildlife habitat, that’s not really us feeding this furry friend – although it is kinda cute! When one’s feeding backyard birds, the objective is usually to see those birds! If you’re getting on up there in years, and your eyesight’s not so great (like me)… keeping a pair of binoculars near the main watching window is always convenient. Squirrels, blasted squirrels always seem to find and conquer anything that doesn’t have a baffle on it. One lousy window bird feeder (that’s actually mounted on the deck rail) for seeing birds close-up, always seems to have a squirrel in it! Little pigs are even fed, and have their own feeders with which to contend, but alas… it’s never enough. Well, this new handy dandy window feeder just might do the trick! With an innovative cage for keeping squirrels out, the birds may just be able to eat in peace… where I can actually see them sans the binoculars. Can’t wait to fill ‘er up and try this one on for size! add a squirrel baffle and forget about it! Whether you feed squirrels or not (yes, many folks actually do) the last place you want to see them is in your bird feeders… period! 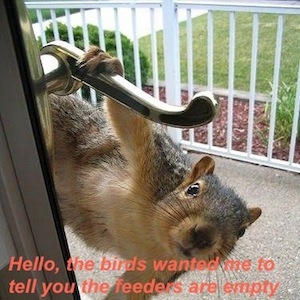 And inevitably, no matter how much you feed the critters, they’ll still go for your birdseed. The only surefire way we’ve ever witnessed to keep them at bay is by installing a decent squirrel baffle. It’s a one-time investment that promises you’ll never have to deal with the issue again. Some people “grease” their poles, and this may work for a while, but it becomes a continuous chore. Cylinder and cone shaped baffles are most common fo r feeder poles. Say you have a shepherd’s hook and the baffle won’t fit around the top or the bottom ground stake? No problem – many of the cone baffles actually open and lock, allowing for placement on the fanciest, and curviest of poles. A hanging baffle is best suited i f your feeder’s suspended from a tree limb or branch. Baffles like these do double duty, acting as weather guards to protect both food and dining birds from the elements. But be careful, not all weather guards are hefty enough to qualify as an effective squirrel baffle. You can even try to make your own baffle with a few supplies from a home improvement store. Stovepipe type baffles have plans available online, Just do a search “stovepipe baffle”. They can be made from sheet metal or PVC pipe. Whatever type of baffle you may choose, feeder placement is the key! Make sure there is no horizontal “launch” point for squirrels to jump from, and if hanging, be sure the bottom of the feeder is at least five to six feet from the ground. So heed these precautions… as squirrels’ acrobatic stealth is nothing short of amazing! squirrel proof bird feeders for peace of mind – let them choose with an e-gift! Out of time? Out of good ideas? Read on! 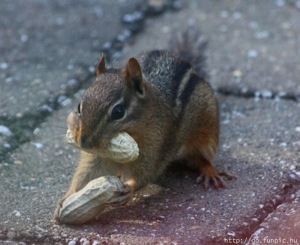 Ok, so he’s a chipmunk, but squirrels can be infuriating for some, while others actually encourage them with specialty feeders that are pretty entertaining to watch. Investing in quality squirrel proof bird feeders ultimately saves money by saving birdseed, and we promise… they make for better and more relaxing backyard bird watching! Some squirrel proof feeders a hoot to watch, like the Droll Yankees line of Flippers, Whippers, Tippers and Dippers… yes, they really do have different features. Many styles of caged feeders keep little paws and claws from reaching seed through sheer design and structure. Even if squirrels can get to the cage, they can’t reach the seed, and soon give up. The Suet Sanctuary is the original suet feeder that’s squirrel proof too. Reaching little hands just can’t reach the suet. Smaller songbirds, and even some woodpeckers can dine in peace, without wasting suet to gobbling, piggy squirrels. Another fantastic squirrel proof bird feeder is Arundale’s line of Sky Cafes. The video is hilarious and they’re considered the “Fort Knox” of bird feeders. The innovative design keeps squirrels at bay, no matter their level of acrobatic expertise! The good news is you can still make someones’ Christmas Day stupendous by sending an e-gift card so they can choose their own squirrel-proof bird feeder or squirrel feeder, or bird feeder, or birdhouse! We’ll even design a handsome certificate and forward it along to the recipient, or to you for color printing. Just box it, wrap it, place it under the tree and viola… Christmas gift extraordinaire… immediately! Enjoy feeding birds… not squirrels? When all other solutions against pesky squirrels raiding your feeders fail, then it’s time for some squirrel proof bird feeders that really work! 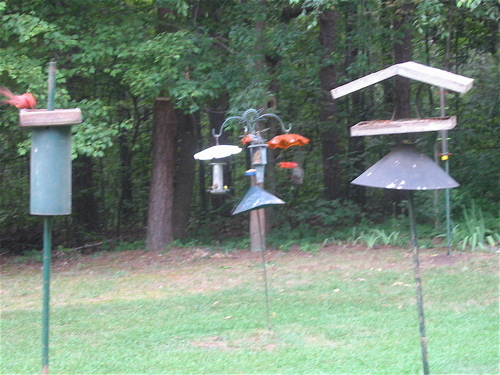 The line of Sky Cafe feeders is innovative, attractive and durable, they even guarantee against squirrel shenanigans. 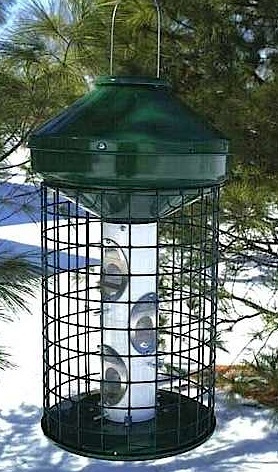 When these feeders are hanging, squirrels can not get past the large, wide baffle, and the cool design even helps protect seed ports from weather. A large capacity, non-cage style squirrel proof feeder, dining birds are easily viewed from all angles with no obstructions. You’ll sp end less time filling and more time watching beaked buddies in your yard. Several styles and colors are available, this one even has seed dividers for an “Al a Carte” menu! Sometimes a baffle just isn’t enough, like when squirrels figure out that horizontal launching point from where to jump sideways to reach the feeder. For example, say you’ve got a pole-mounted bird feeder near your deck (so you can watch birds from inside the house). A baffle on the pole will keep crafty critters from shimmying up from the ground, but most times they can jump sideways from the deck to reach the feeder… like about ten feet horizontally! You’ve likely heard of them before, the Yankee Flipper, Tipper, Whipper and Dipper… but what’s the difference? Droll Yankees is an industry leader in squirrel proof bird feeders. They’re line of weight-calibrated feeders mentioned above is unsurpassed, squirrel’s shenanigans just don’t stand a chance! But the four similar names of these squirrel proof bird feeders might pique one’s curiosity as to their differences. First, it’s a good idea to know that all of these squirrel proof bird feeders are the same size, with same large, five-pound capacity. Each also contains four feeding ports. Colors differ with each model, the Dipper is burgundy, Flipper is hunter green, Whipper is midnight blue, and the Tipper is classic black. They all have similar product features and lifetime warranties against squirrel damage too. So let’s start with the Yankee Dipper: Basically it operates with four collapsing straight perches, which drop with the weight of anything larger than a Cardinal. Smaller birds like Titmice and Nuthatches are drawn to this type of straight perch at a tube feeder. 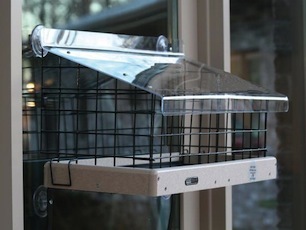 The Tipper is a squirrel proof bird feeder complete with a seed tray, and allows more birds to feed at once. Birds who may not actually “perch” may be seen feeding on a seed tray. The tray simply tips 180 degrees when the weight is more than that of four Cardinals at once. The Whipper also features four collapsable perches, but these are curved and longer, with Cardinals in mind. They can feed “straight-on” which is more comfortable and inviting for them-and many other medium-size songbirds. The Flipper (pictured at top) is actually motorized with a circular perch. The weight triggers the motor to spin, gently tossing the squirrel off the feeder. Droll Yankees crafts amazing squirrel proof bird feeders of the highest quality. To see product videos of each of these feeders, just click on the corresponding photo. Investing in a great quality feeder like one of these, will save you birdseed, money, and spare much aggravation… they’re even quite entertaining to watch! They’re constantly trying to outwit every single one of the bird feeders, but always foiled by the ones set up with baffles. Setting up a new feeder on the back deck so I could catch some close-up views from the kitchen and breakfast room window was a great idea in theory. A hopper seed feeder hangs from a deck bracket. In between the two, a motorized squirrel baffle that is weight-sensitive. At first the spinning feeder would cause the squirrels to want “off” this ride. But after a while, they got use to it and learned to hang on, and even manage a seed or two during the wild ride. Eventually I gave up and moved the feeder away from the deck and hung it on a pole with a baffle. This solved the problem and still allowed for close-ups of feathered friends. 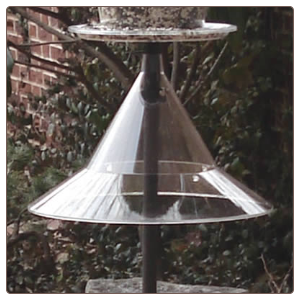 Squirrel baffles, when properly placed, will turn any feeders into true squirrel proof bird feeders… once and for all! Backyard birding can bring a few frustrations to the serene and peaceful hobby. 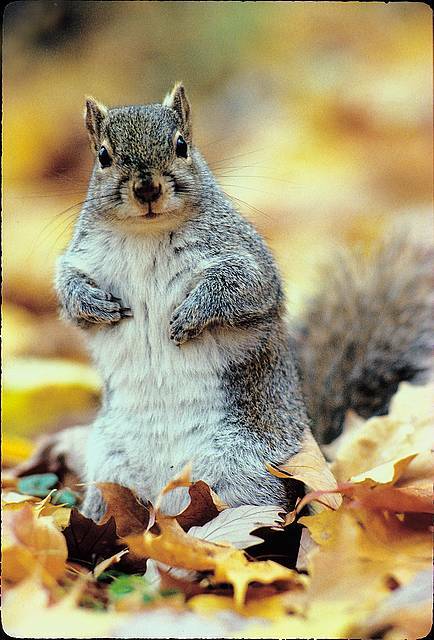 Namely squirrels… they can cause some damage and be a real bummer when constantly raiding bird feeders. There are fairly easy ways to turn your existing feeders into squirrel proof bird feeders. With some careful placement and a quality squirrel baffle, your squirrel headache will be solved for good! Economical plastic or metal baffles may be installed for pole-mounted feeders and hanging feeders too. On the pole, the baffle sits below the feeder and keeps squirrels from reaching the feeder above. 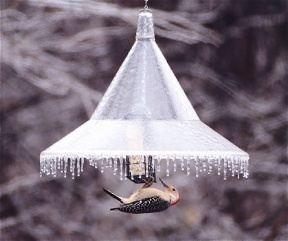 When used on hanging feeders, baffles act as a shield to keep the critters from reaching down past them to the feeder. Some baffles, like the Twirl-A-Squirrel shown here, have a motorized compartment which reacts and spins when the weight is significantly increased. It’s very effective against squirrels, and extremely hilarious to watch. But don’t worry, it will not harm the spinning squirrel… only make him a bit dizzy – depending on how long he wants to hang on! Ever more challenging is the war against squirrels! These furry critters can do some real damage to your wallet as they can eat their weight in bird seed in one week. Now, multiply that by the 8 or 10 squirrels who hang out in your yard and that’s a problem! 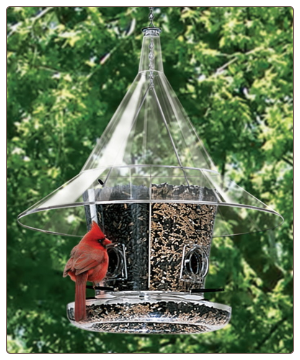 As more folks get into the great hobby of backyard birding, so do more squirrel resistant feeders become available to us. Squirrel proof bird feeders have come a long way from the plain old caged versions. These still work great too, but other, more attractive options may be what you are seeking. 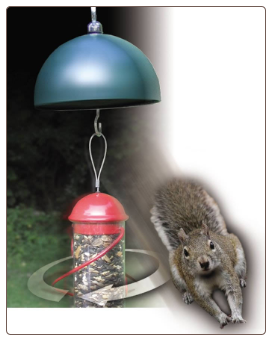 This sleek, slim-line squirrel proof bird feeder is complete with a built in baffle. It even includes the pole for mounting. With an all-inclusive feeder such as this, you can forget the worries of adding bird accessories to complete the job. Always remember, squirrels can jump sideways up to eight feet, so when placing your feeder, be sure it is not too close to any type of horizontal launching point for the sneaky acrobats! The Best Squirrel Baffles are the Ones That Work! Let’s face it…squirrels can ruin the joys of backyard birding in no time flat! They can eat their weight in seed in one week, and destructive little devils… they’ll chew through feeders like tomorrow! Squirrel Baffles that are not used correctly are useless. They must be strategically placed to keep squirrels at bay. After all, they are crafty little critters who can jump up to six feet high and eight feet across, just like little supermen. The electronic squirrel baffle called the Twirl-A-Squirrel, takes the guess work out of squirrel baffle/birdfeeder placement. This innovative little gadget allows you the complete liberty of placing bird feeders where you actually want them, and not just where squirrels can’t get to them. A pretty important factor to take into consideration if you enjoy feeding your feathered friends and bird watching! The Twirl-A-Squirrel is absolutely harmless to squirrels as well, the motorized baffle gently spins them to the ground when they can no longer hang on to the feeder. Check out the video below…it’s hilarious! It really doesn’t spin that fast…this video has been remixed, but you’ll get the jist.